Khatron Ke Khiladi is one of top most TRP rating reality show. This is the ninth season of Khatron Ke Khiladi. This is an Indian reality show a stunt television series premiered on 5th January 2019 and airs on Colors Tv. The series is produced by Endemol India. Filmed in Argentina, it is hosted by Rohit Shetty. The reality show Khatron Ke Khiladi gave you high-voltage of fun and drama too. The reality show Khatron Ke Khiladi is getting much more in trusting because of Bharti Singh who is the comedian. She makes the show too funny. 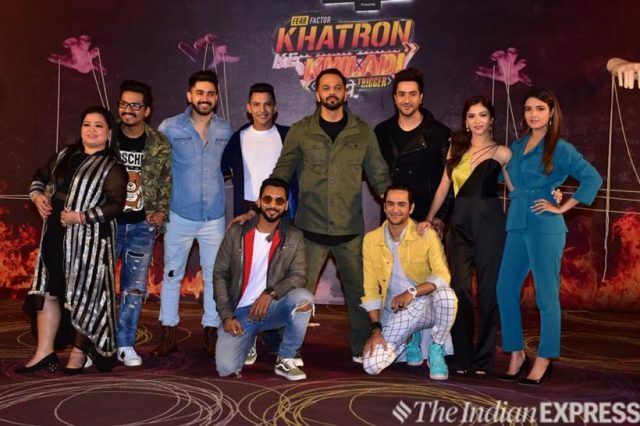 The latest episode of Khatron Ke Khiladi 19th January 2019, written episode update begins with the elimination round. The student is performed by Haarsh Limbachiyaa and Vikas Gupta. One by one they were seated on a chair, and the chain gets locked. They have to remove the keys up on a wall with the help of a stick. But there was a high voltage or current the wall and their feet are also put it in the water. Bharti received the major electronic shock and was seen crying. To saw, Bharti was crying all contents gets burst in tears. Harsh toon tried the stunt but did not shout despite receiving shocks so that Bharti does not feel frightened. Vikas, who felt guilty to put Bharti into the elimination stunt, he decided to lose to put Bharti would make it to next level of Khatron Ke Khiladi. Rohit gets very angry and ordered to perform the stunt and not do drama. After the stunt, Rohit reveals that there was no elimination round and Vikas became emotional. So this is time to perform the 2nd task and that was to hang in the air and that was performed by Jasmin Bhasin, Aly Goni and Sreesanth. To know the winner you get shocked. Sreesanth was the winner of the task while he has an injured leg won the task while the other two gets the fear band.